Requirements for the manufacture of controlled substances impact all aspects of drug development, manufacturing and distribution. CDMOs that have an in-depth understanding of the regulations, long-standing positive relationships with regulators and a track record of successfully working with controlled substances can accelerate product development and commercialization so that treatments are made available more quickly. The Controlled Substances Act (CSA) in the U.S. is a federal regulation designed to prevent the diversion of certain potentially harmful substances for illegal use. Various narcotics, stimulants, depressants, hallucinogens and anabolic steroids, including plants, formulated drugs and specific chemicals, are assigned to one of five schedules depending on their medical applicability and potential for creating dependency and being subjected to abuse. Manufacturers and distributors of any substances covered by the CSA must be registered with the DEA. Before beginning the licensing process, companies must not only become familiar with the various security and record-keeping requirements, but see that their facilities are fully compliant to ensure control, traceability and accountability. For instance, larger quantities of a Schedule II substance must be stored in a vault in which all six walls are constructed of at least 8” of substantial masonry and the door and frame meet strict design specifications. Large quantities of Schedule III-V substances, on the other hand, can be stored in cages, but the walls and doors must be made out of a certain gauge wire, posts placed according to regulation, etc. Smaller quantities of a scheduled substance can be stored in a safe or steel cabinet, again, as long as certain construction qualifications are met. A record-keeping system must also be in place to provide traceability of any and all controlled substances either coming into or being shipped from the facilities. Once it has been confirmed that all of the security and record-keeping systems are in place, the first step is to apply for a State Board of Pharmacy license, which requires completion of the state’s application and on-site inspection. Once that license is received, a company can then submit an application for registration with the DEA. It is also important to note that separate registrations are required for manufacturing, distribution, analytical testing (in specific situations), importing and exporting. Manufacturers of controlled substances— both active pharmaceutical ingredients (APIs) and formulated products — receive quotas from the DEA that dictate the quantity of controlled substance that can either be made (API) or procured (for use in finished product manufacturing) during a given year. The purpose of quotas is to limit production to the amount required to meet legitimate medical needs. By April 1 of each year, those companies wishing to procure controlled substances for manufacturing use must submit their application indicating their quota needs for the following year, including estimates of the quantities of each controlled substance they will produce and raw materials they will use. Manufacturers of bulk controlled substances must submit their quota applications by May 1 of each year. From the submitted quota applications, the DEA establishes Aggregate and Procurement Quotas. The Aggregate Quota dictates how much controlled substance can be manufactured in the U.S. Procurement Quotas establish the amount of a controlled substance a finished dose manufacturer may purchase for manufacturing use. To purchase controlled substances as raw materials (such as an API for production of a formulated product), the purchaser must provide the supplier with its DEA certificate, as well as a Certificate of Available Procurement Quota confirming that it has unused quota available to cover the quantity being purchased. If projects come to a contract development and manufacturing organization (CDMO) later in the year, it is possible to apply for quotas for controlled substances at that time. It is also possible to apply for an increase in quota if the assigned quotas turn out to be insufficient. As part of an application for quota increase, a company must provide detailed information as to how the previously granted quota was used, i.e., testing, waste, finished product. It takes approximately four weeks for the DEA to process an application for an increase in quota — a time frame that cannot be accelerated. The use of the quota system, with aggregate annual quotas for each controlled substance, in essence results in a fixed market. However, although it can be more difficult for newer products, manufacturers are very good at predicting the quantities needed. To date we are unaware of any time when an aggregate quota was insufficient. There can be significant production delays, however, if additional quota must be requested. Perhaps the most challeng- ing situation is the receipt by a formulated drug manufacturer of API that doesn’t meet specifications and must be returned to the supplier. In most cases, the supplier must first apply for additional quota in order to receive the rejected material back into its facility. Then, if unused quota is not sufficient, the drug manufacturer must apply for additional quota in order to receive a new batch of the API. It is a four-week process for both applications, resulting in a possible project delay of eight weeks. Preventing diversion of controlled sub- stances is the main goal of the CSA. Trace- ability and accountability at manufacturing and distribution facilities are the ultimate goals of the control and reporting requirements of the regulation. Extensive record-keeping is therefore essential. Manufacturers can choose to report on a monthly or annual basis. UPM Pharmaceuticals elected to report monthly in order to achieve a higher level of accountability, helping to identify any issues more quickly. For manufacturers, these monthly or annual reports include overall production information — what material came into the plant and how it was used. Detailed biannual inventories are also required by the DEA. In these reports, manu- facturers provide a snapshot of all controlled substances currently held under each registration. Year-End Worksheets are also required to be filed by January 31 of each year. Each worksheet acts as a reconciliation of the yearly activity for each controlled substance for which a quota had been granted. A worksheet reflects what was on hand at the end of the previous year, plus all the incoming and outgoing during the reporting year, after which, like a checkbook, everything must balance. When seeking contract service providers for projects involving controlled substances, it is essential that sponsor firms select the right partner. The consequences of noncompliance with the regulations of the CSA can be immediate and severe. If the DEA finds evidence of substantial diversion, the agency can order a facility to cease operations immediately. When seeking contract service providers for projects involving controlled substances, it is essential that sponsor firms select the right partner. A reliable CDMO will have a long, successful track record of compliance with controlled substance requirements, including meeting reporting requirements. Strong controls, effective handling and maintenance procedures and an excellent record-keeping system are also essential. As important is an in-depth understanding and working knowledge of the regulations and requirements stemming from a long term, positive relationship with the DEA. UPM Pharmaceuticals has a long history of manufacturing and distributing many different types of controlled substances. Our highly qualified and experienced personnel have always taken a proactive approach when dealing with the DEA. Our in-house training program ensures that operators and other employees who handle controlled substances understand the importance of following company procedures to ensure compliance with the CSA and avoidance of any diversion of controlled substances. 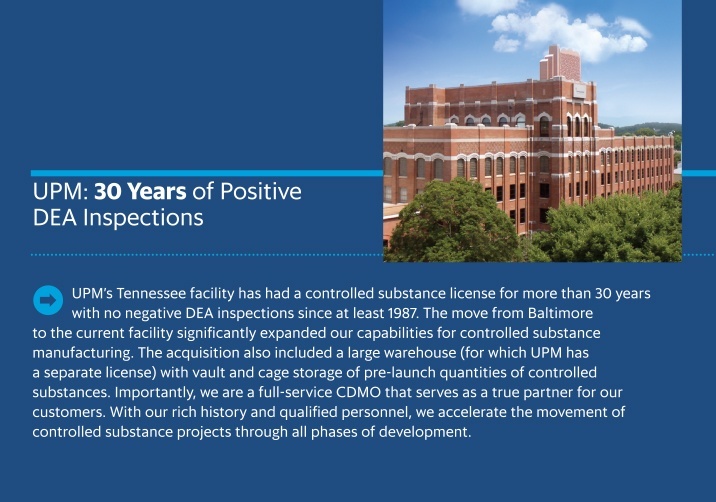 As a client-focused CDMO, UPM is vested in providing more than just capacity for the production of controlled substances. We work closely with our customers to make sure they understand all aspects and implications of the CSA. In addition, with an analytical laboratory approved to handle Schedule I-V controlled substances and listed chemicals, we can sup- port our clients with formulation development and stability/degradation testing. Our R&D group also investigates abuse deterrence solutions for controlled sub- stances that both DEA and the U.S. Food & Drug Administration have interest in. The ability to support controlled substance projects in-house from the proof of concept stage through to commercialization/product launch, including formulation development, process and method development, validation and warehousing, does away with the need for technology transfer of these challenging projects off-site to other vendors. Clients save both time and money while getting their products into the hands of patients more quickly. When dealing with controlled substances, avoiding diversion through the use of ap- propriate controls and record-keeping is absolutely crucial. Sponsor firms need to identify reliable CDMO partners with a proactive approach to managing controlled substance projects and a successful history of completing them. Yeh, Brian T. The Controlled Substances Act: Regulatory Requirements. Rep. Congressional Research Service. 13 Dec. 2012. Web. Kim Noll serves as UPM’s DEA Liaison and Commercial Project Manager. 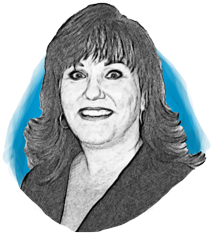 Mrs. Noll has over 23 years experience in the pharmaceutical industry. As UPM’s DEA Liaison, Mrs. Noll is responsible for all DEArelated activities at both Bristol, Tennessee facilities, and supports corporate tactical and strategic goals relative to DEA compliance as well as Commercial Project Management. Mrs. Noll continued her roll through the transition from King Pharmaceuticals to Pfizer and from Pfizer to UPM.